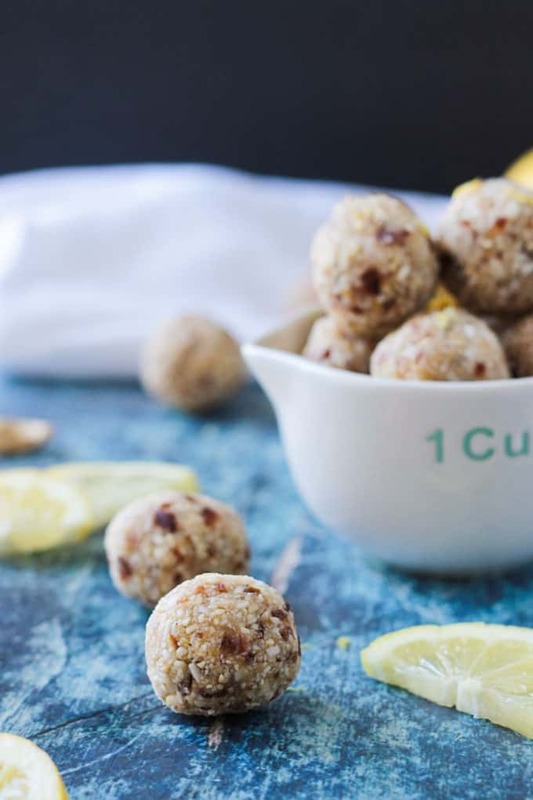 Lemon Coconut Cashew Date Balls – little bite size energy bites with light and bright flavors perfect for spring. Great for breakfast on the go, a pre or post workout snack, an afternoon treat, or even a sweet treat nibble for dessert. Pairs perfectly with coffee or tea! As soon as spring hits, I start craving all things citrus. This makes no sense since citrus is a winter fruit. I’m drawn to the bright light colors and the fresh juicy flavors. Something about it just reminds me of all things spring. Kind of like my Gluten Free Thumbprint Cookies that we always make at Easter time because of the pretty pastels. 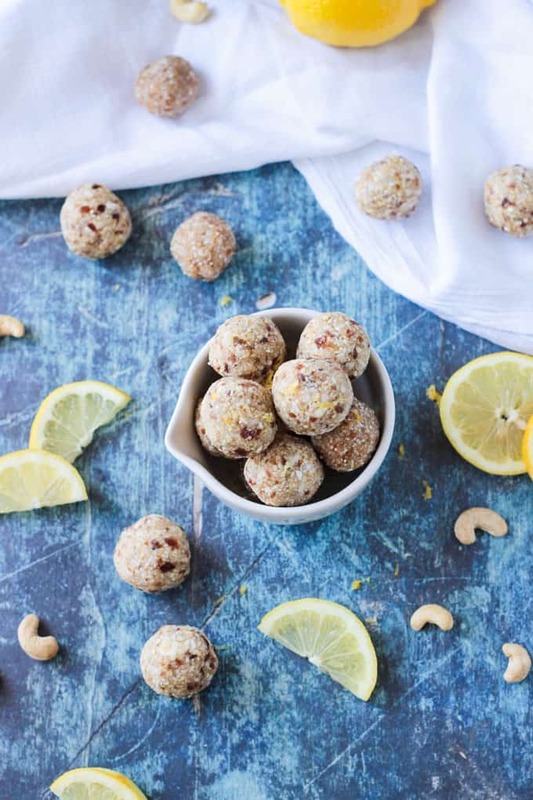 Luckily, citrus is generally available all year round, so these delicious little Lemon Coconut Cashew Date Balls can be enjoyed anytime. 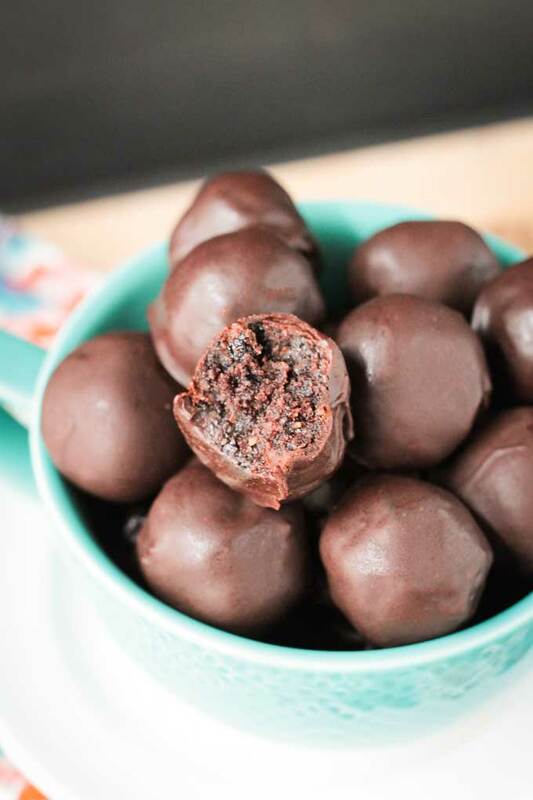 Energy bites, truffles, bliss balls ~ these cute little nibbles of nutritious goodness go by many names. They are incredibly versatile, usually containing some variety of nuts or seeds and dried fruit, along with flavorings. 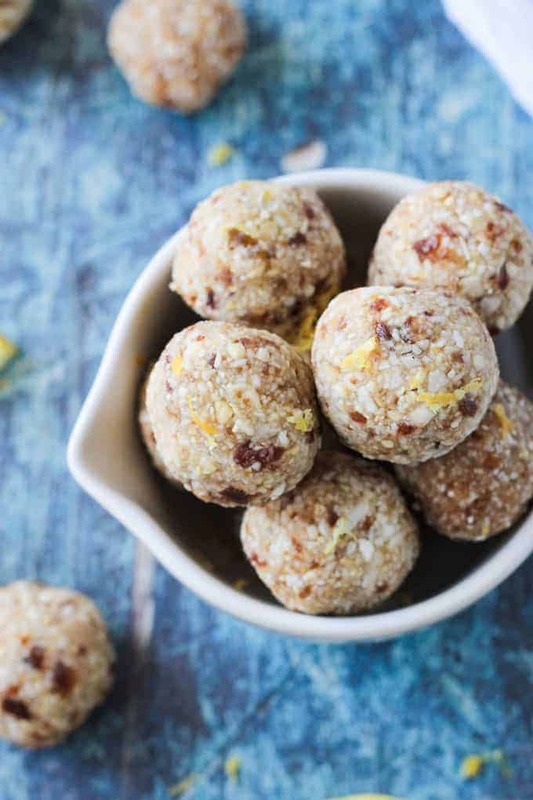 In these Date Balls, I combined cashews, coconut, dates, lemon zest and juice, and just a touch of vanilla to even out the flavors. Raw, gluten free, oil free, refined sugar free, and of course, vegan. Just one or two is enough to calm my sweet tooth when it acts up. Or to give me a shot of energy during my afternoon slump. 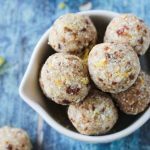 And sometimes I like a little something with a cup of tea before bed and these date balls with coconut are perfect for that! These little bites could not be easier to make. Everything goes into a food processor. A minute or two of pulsing and the mixture is ready. Then just press and roll them into bite size balls. Even the kids could do it! Just be careful of the sharp blades – you might want to help them get the mixture out of the food processor before letting them roll them. 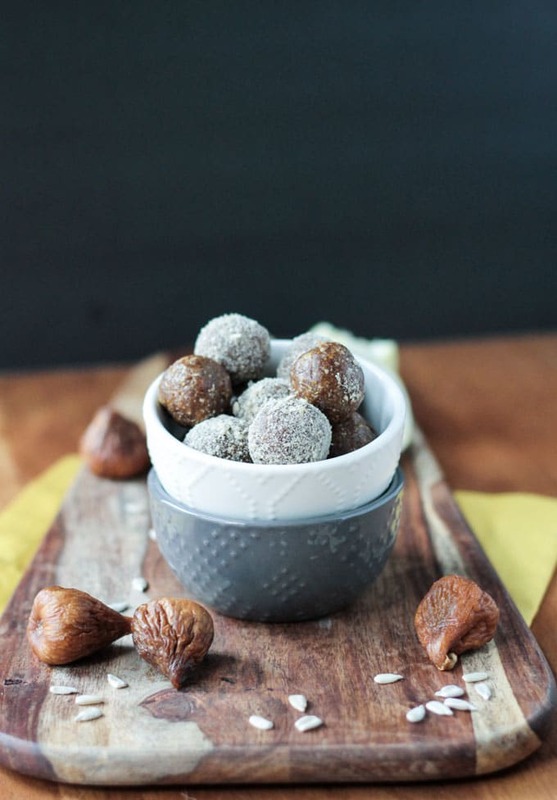 I hope you love these Lemony Date Balls as much as we do. If you try them, please come back and leave me a comment below with your feedback and star rating. You can also find me on social media. Be sure to tag @veggie_inspired and #veggieinspired so I’m sure to see it. Enjoy! 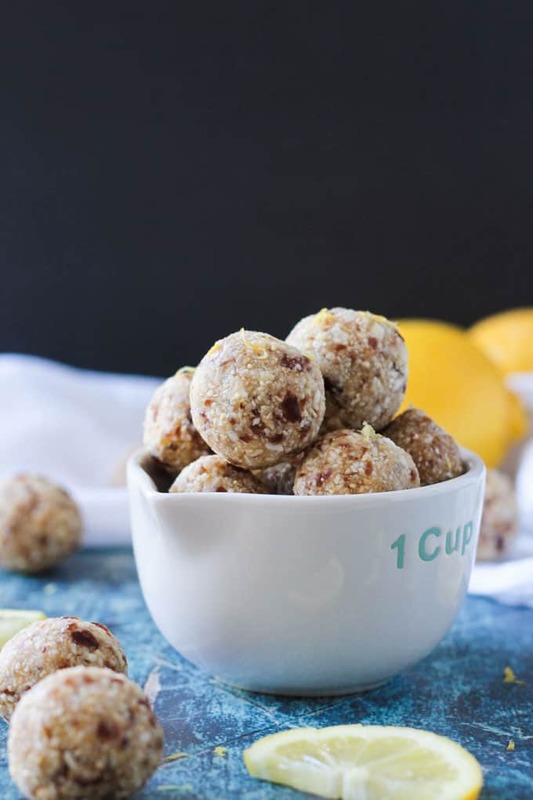 Lemon Coconut Cashew Date Balls - little bite size energy bites with light and bright flavors perfect for spring. Great for breakfast on the go, a pre or post workout snack, an afternoon treat, or even a sweet treat nibble for dessert. Pairs perfectly with coffee or tea! Pulse the the cashews and coconut in the bowl of a food processor until it resembles course meal. Add the remaining ingredients and pulse until combined. Do not over-process - there should still be some texture, not completely smooth. Enjoy immediately or store in the fridge. I’ve never used lemon in date balls before. I’m intrigued by the idea. I’m going to try making them really soon so I can taste-test the lemon flavor. I usually love lemon so it should be interesting. I wonder, do kids like these or are they not sweet enough (my kids shy away from citrus flavors that are the slightest bit sour). Anyway, I’m looking forward to trying them. My kids would prefer chocolate over these, but they did like them. They are sweet – the dates, cashews and vanilla all give a sweet flavor. The lemon is prominent, but not sour at all. And the coconut helps to balance it too. I can’t wait to hear what you think! Please come back after you try them and let me know how they turned out! Thanks, Holly! I hope you all enjoy them! 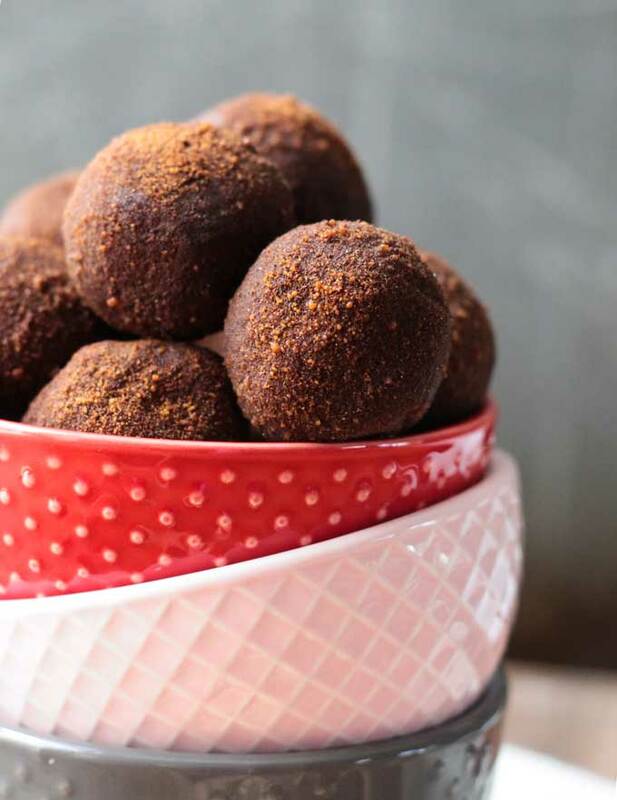 I love every single ingredient in these energy bites so I’m excited to give it a try…very soon! Also, we are ready for spring so I’m hoping these will be like a “energy bite” dance to bring it on faster! HaHa! Yes, I’m hoping spring makes it’s debut soon. It’s sooo cold here! Thanks, Marly! I’m with you, lemon, lime, orange, they all make me think of summer. 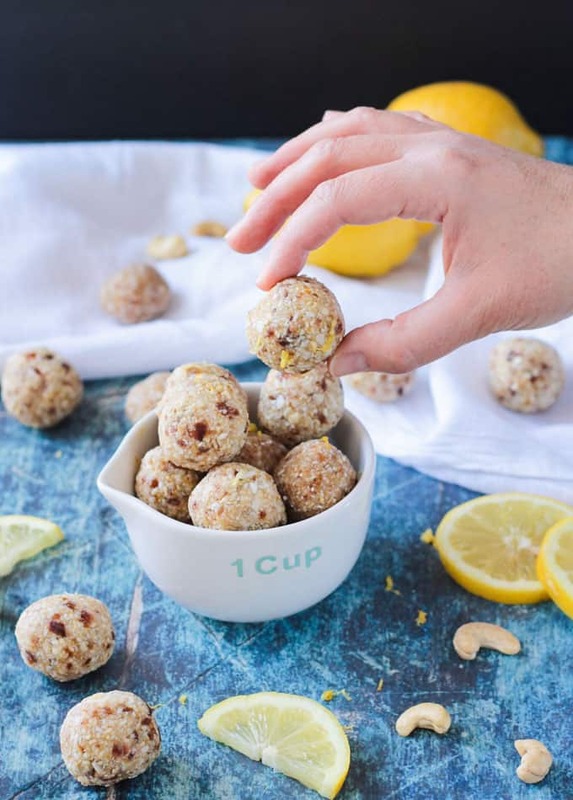 I adore lemon and coconut together so I know I’m going to love these energy bites. They look so good! They’re a match made in heaven, aren’t they?! Thanks, Linda! Loving all the flavors in your bites. Lemon…..coconut…sounds perfect for springtime too. I love the way you have used these super health ingredients… and that lemon – perfect!